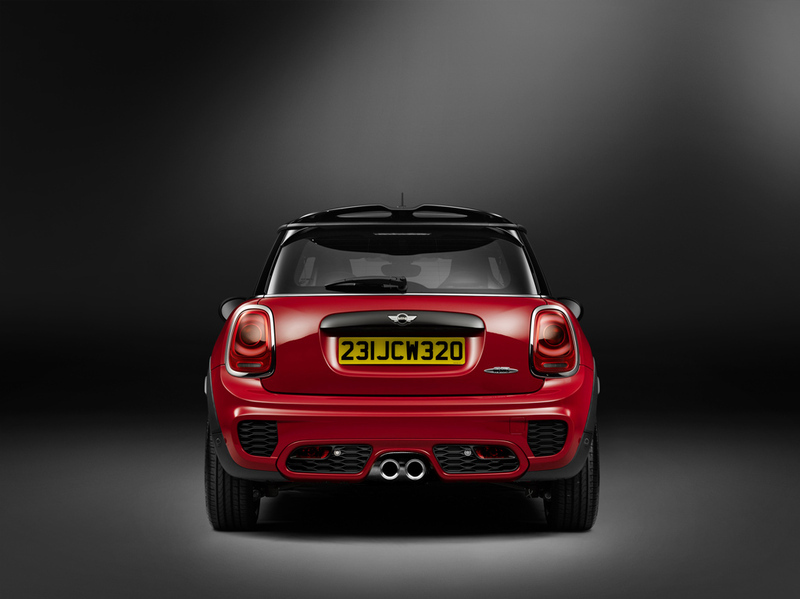 This entry was posted in news and tagged MINI JCW press press kits on December 10, 2014 by James Day. Green light for the latest edition of the top athlete in the small car segment; the new MINI John Cooper Works combines authentic race feeling with the premium characteristics and extended product substance of the latest MINI Generation; distinctive, tradition-steeped, based on a vehicle concept combining MINI and John Cooper Works, with performance qualities which are exceptional within the competitive environment. 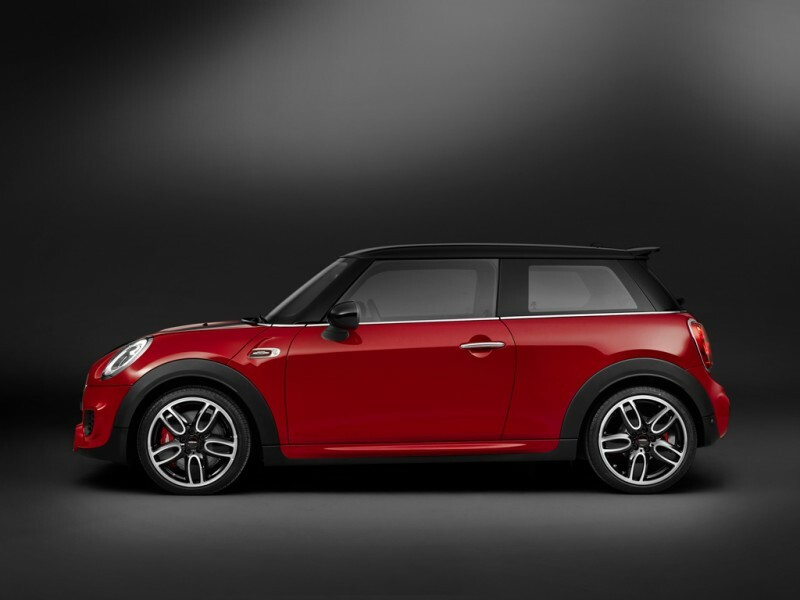 Extreme driving fun and exclusive charisma based on technology for engine, suspension and aerodynamics derived directly from motor racing as well as model-specific design features for the exterior and interior; greater differentiation from the MINI 3 door highlights the model’s individual character. 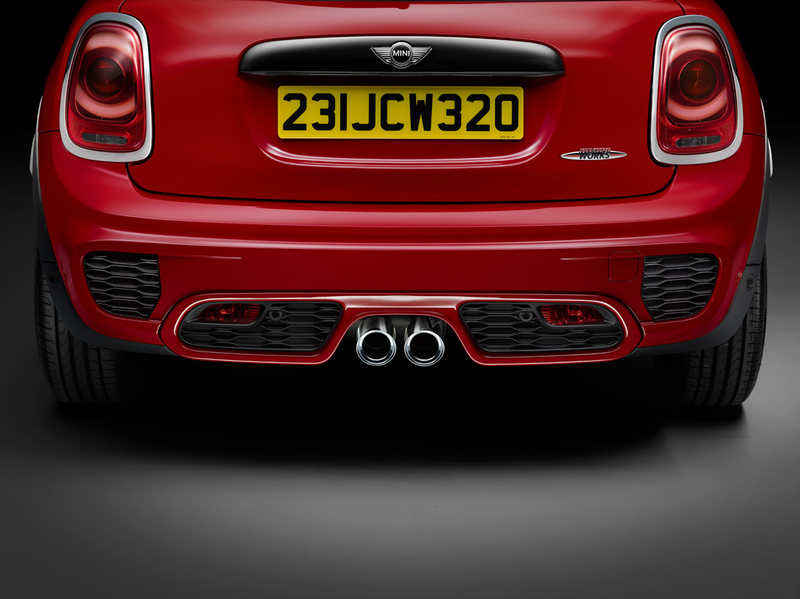 Most powerful engine ever fitted in a serial production model of the British premium brand; 2.0-litre 4-cylinder spark ignition engine developed based on well-established racing expertise drawing on the latest generation of power units with MINI TwinPower Turbo Technology; output increased to 170 kW/231 hp, performance-oriented power delivery and highly emotional sound due to specific design of pistons, turbocharger and exhaust system, combined fuel consumption according to EU: 6.7 l/100 km, combined CO2 emissions: 155 g/km. 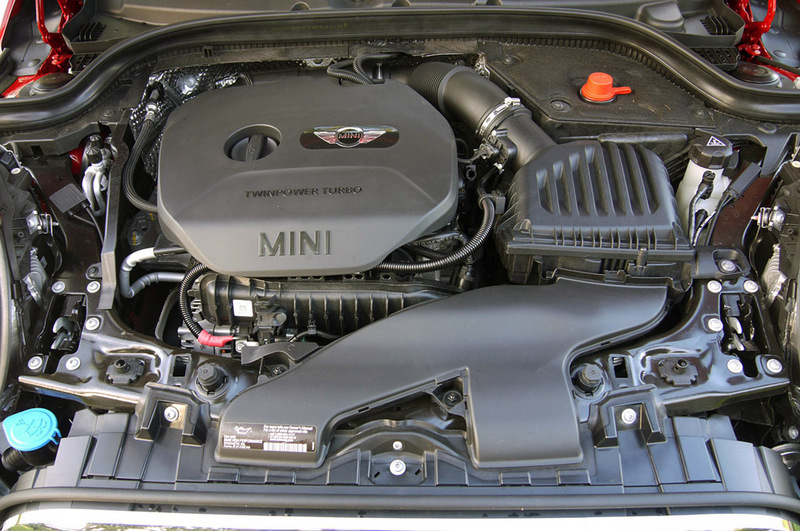 Engine output increased by 10 per cent as compared to predecessor model; maximum torque increased by 23 per cent to 320 Newton metres; 6-speed manual transmission as standard, 6-speed Steptronic sports transmission as an option; acceleration from zero to 100 km/h in 6.3 seconds (minus 0.2 seconds) with manual transmission or 6.1 seconds (minus 0.6 seconds) with automatic; elasticity improved by 10 per cent (80 – 120 km/h in 5.6 seconds); 6-speed manual transmission as standard, 6-speed Steptronic sports transmission as an optional extra; fuel consumption and CO2 levels in conjunction with automatic transmission reduced by approximately 20 per cent to 5.7 l/100 km and 133 g/km in the EU test cycle. 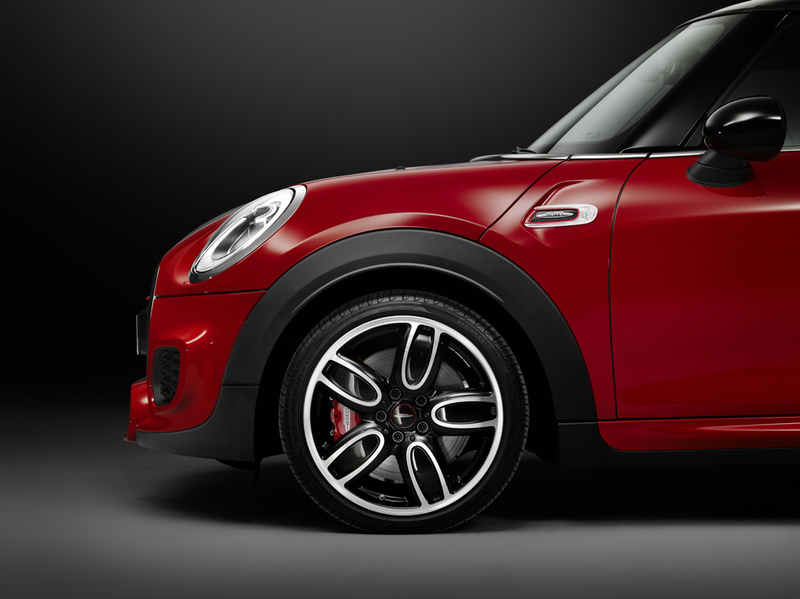 Suspension technology precisely harmonised with the power and performance characteristics of the engine; newly developed Brembo sports brake system; exclusive 17-inch John Cooper Works Race Spoke light alloy wheels; electromechanical power steering with Servotronic; Dynamic Stability Control (DSC) including Dynamic Traction Control (DTC), Electronic Differential Lock Control (EDLC) and Performance Control; Dynamic Damper Control optionally available. 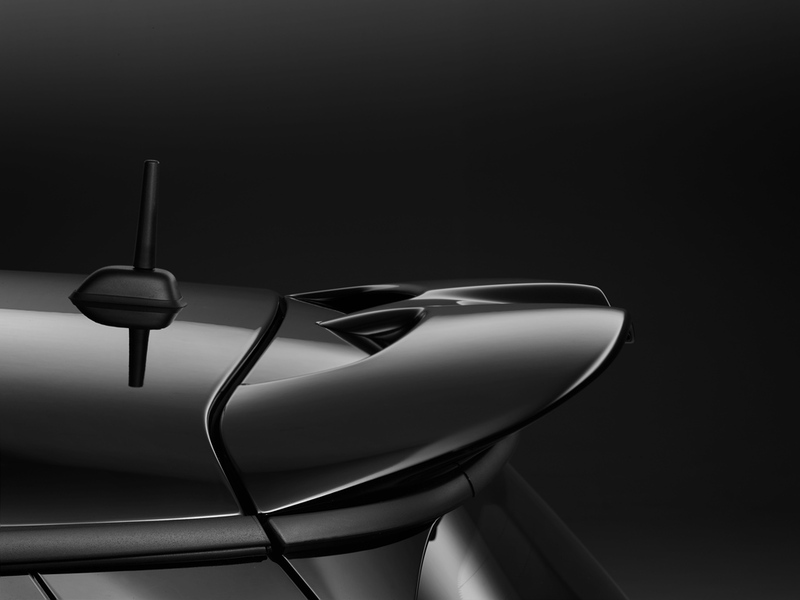 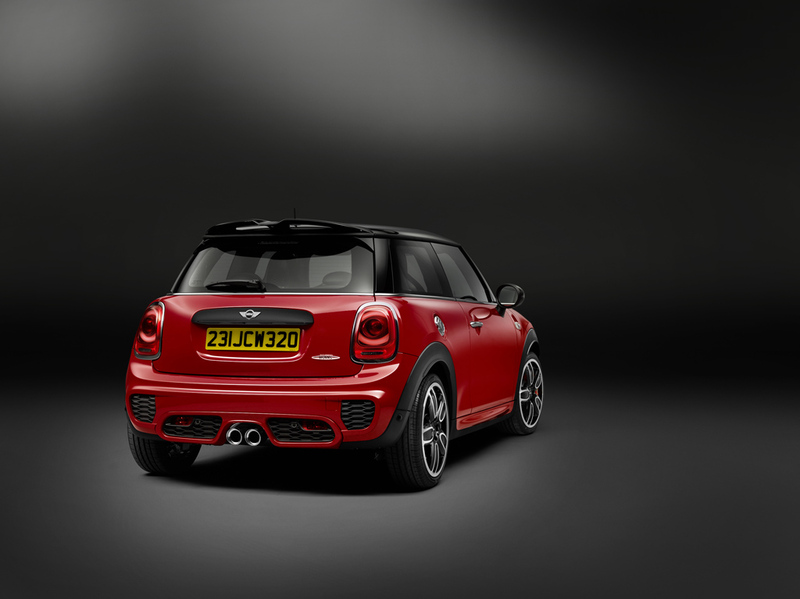 Aerodynamically optimised body design: model-specific front apron with large cooling air inlets which also occupy the space allocated to the fog lamps in the MINI 3 door; distinctive side sill and rear apron design; John Cooper Works rear spoiler. 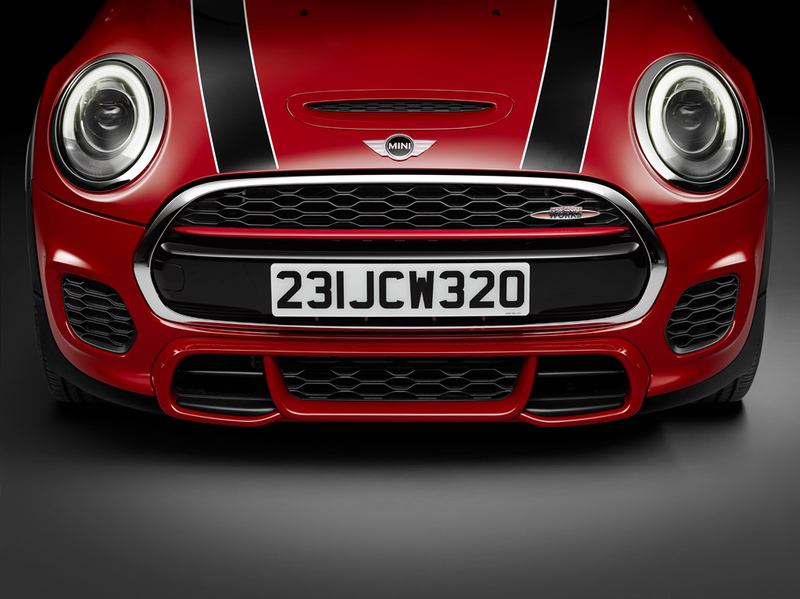 Unmistakable appearance due to model-specific design and equipment features; LED headlamps with white direction indicators; wheel arch surround with distinctive contours; radiator grille, side scuttles and tailgate with John Cooper Works label; sports exhaust system with special tailpipes; new Rebel Green body paint finish available exclusively for the new MINI John Cooper Works. 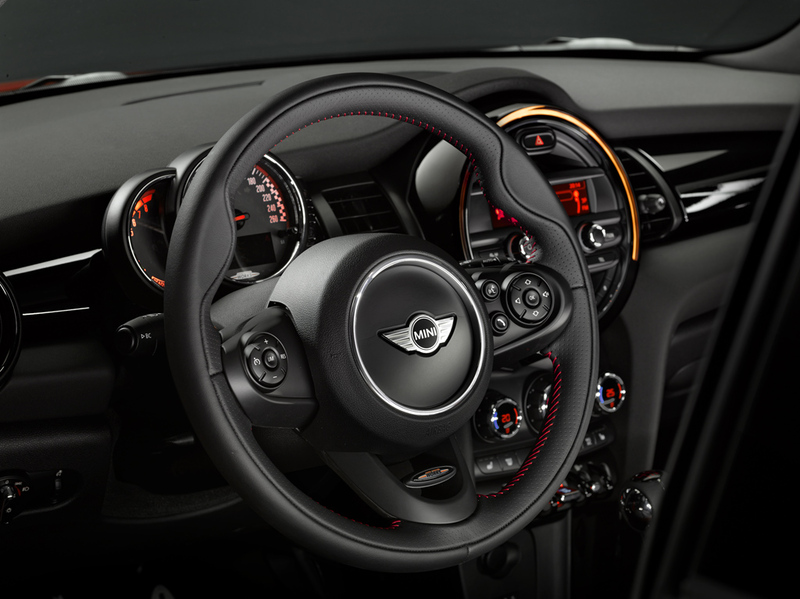 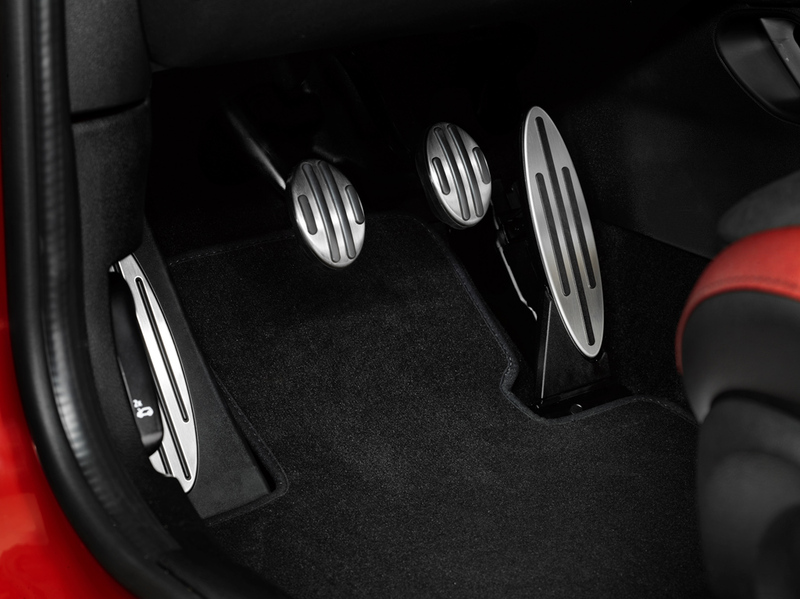 Characteristic sports car flair in the interior; exclusive John Cooper Works sports seats in Dinamica/fabric with integrated headrests; John Cooper Works entry sills; John Cooper Works steering wheel with multifunction buttons and shift paddles in conjunction with 6-speed Steptronic sports transmission; John Cooper Works gear lever or selector lever; cockpit displays, central instrument display and car key in model-specific design; pedals and driver footrest in stainless steel; anthracite roof liner; Driving Excitement package as standard. 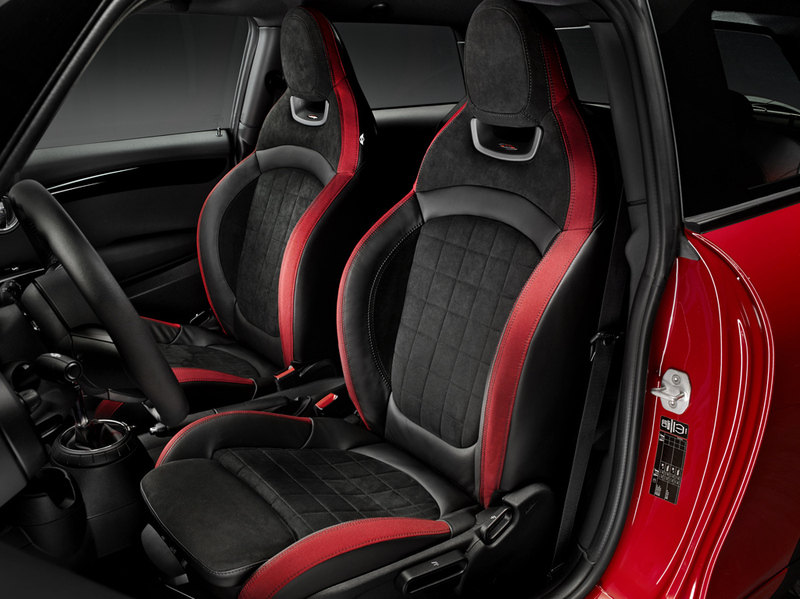 Weight-optimised and crash-optimised body structure; vehicle weight the same as the predecessor model when adjusted for equipment features; standard safety fittings include front and side airbags, side curtain airbags, 3-point automatic belts on all seats, with belt tensioners and belt force limiters at the front, ISOFIX children’s seat attachment at the rear and optionally also on the front passenger seat, tyre pressure control and partially active engine compartment lid for optimised pedestrian protection. 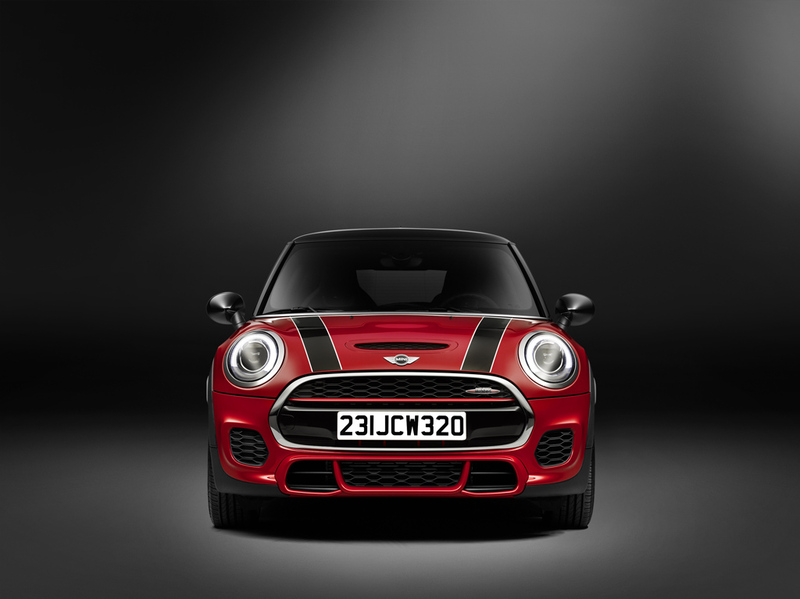 Additional emphasis of the exclusive character of the new MINI John Cooper Works due to model-specific special equipment features and John Cooper Works Tuning accessories; optional MINI Head-Up Display with exclusive display content; roof and exterior mirror covers in Chili Red; 18-inch John Cooper Works light alloy wheels, John Cooper Works bonnet stripes and perfectly harmonised exterior and interior components in the John Cooper Works Pro design line available as part of the MINI Original Accessories program. 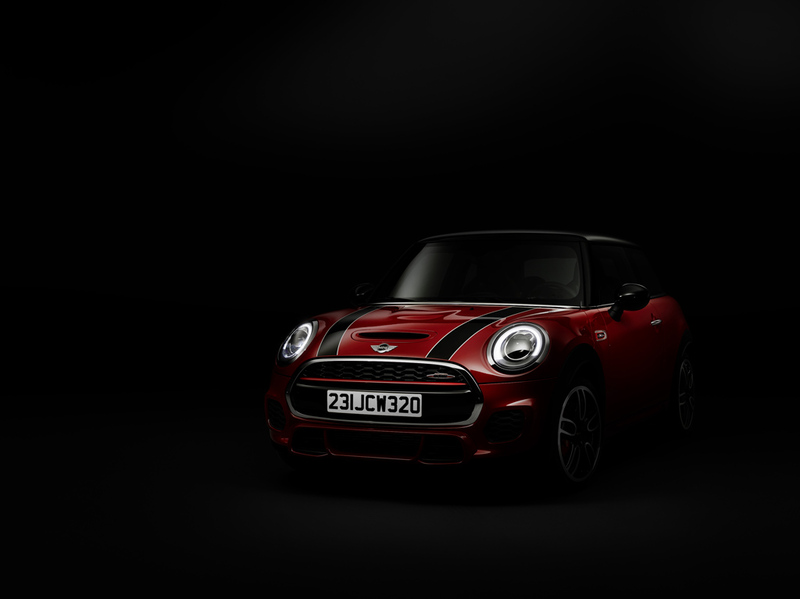 High-end options to increase driving fun, comfort and safety: Park Distance Control; parking assistant; rear view camera; Driving Assistant including camera-based active cruise control, collision and pedestrian warning with initial brake function, high beam assistant and road sign detection; lighting package with LED interior ambient lighting with continuously variable colour adjustment; Comfort Access: electrically operated glass roof; interior and exterior mirror with automatic anti-dazzle function; seat heating; 2-zone automatic air conditioning; MINI navigation system; MINI navigation system Professional; MINI Radio Visual Boost; Harman Kardon hi-fi speaker system; additional customisation options with roof and exterior mirror graphics, bonnet stripes, seat upholsteries, interior surfaces and Colour Lines as well as particularly high-quality MINI Yours features. 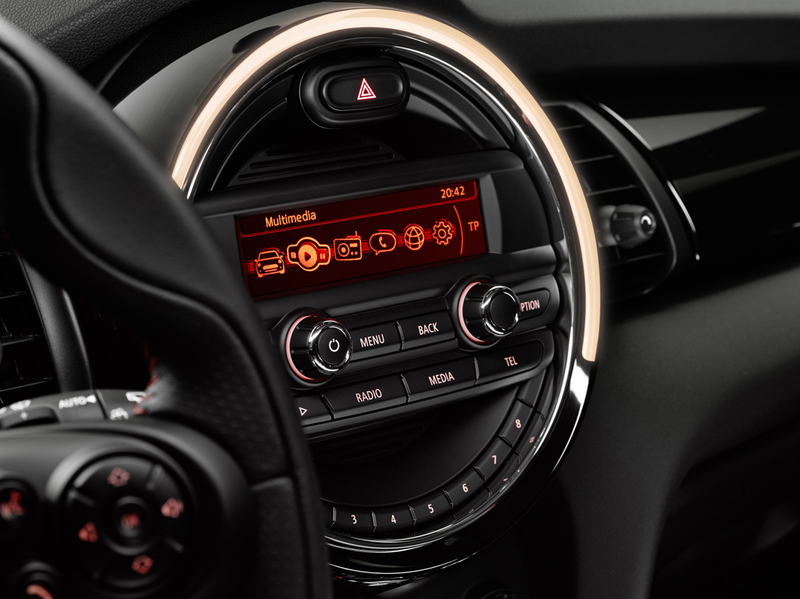 Diverse MINI Connected in-car infotainment program; Intelligent Emergency Call and MINI TeleServices available for use with permanently installed SIM card; wide range of functions and the opportunity for ongoing expansion due to apps that allow integration in the car via smartphone; exclusive MINI functions such as Mission Control, Dynamic Music, Driving Excitement and MINIMALISM; MINI Connected XL Journey Mate with Real Time Traffic Radar; online connection also allows the use of social networks such as Facebook, Twitter, foursquare and Glympse, the reception of RSS news feeds and entertainment features such as Spotify, GoPro, AUPEO!, Stitcher, Deezer, Audible, Napster/Rhapsody and TuneIn. 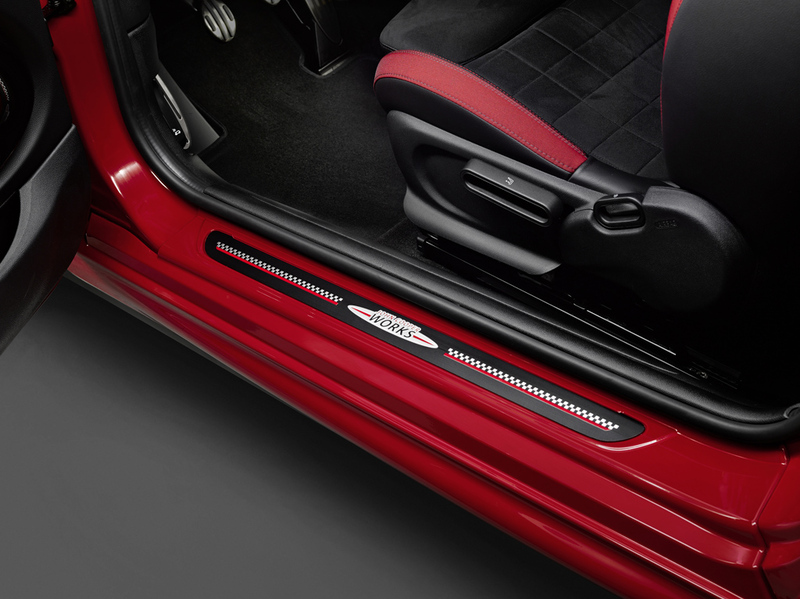 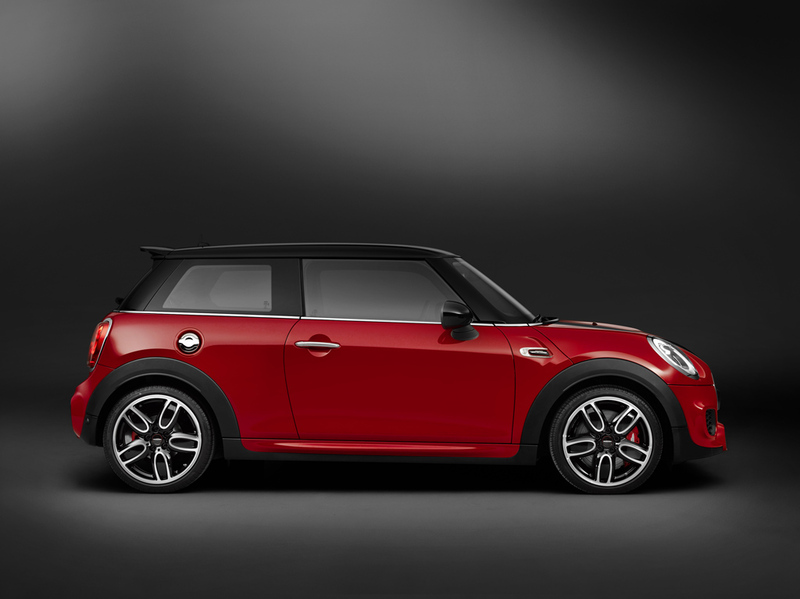 Download the BMW Group PressClub Global Press Kit: The New MINI John Cooper Works. 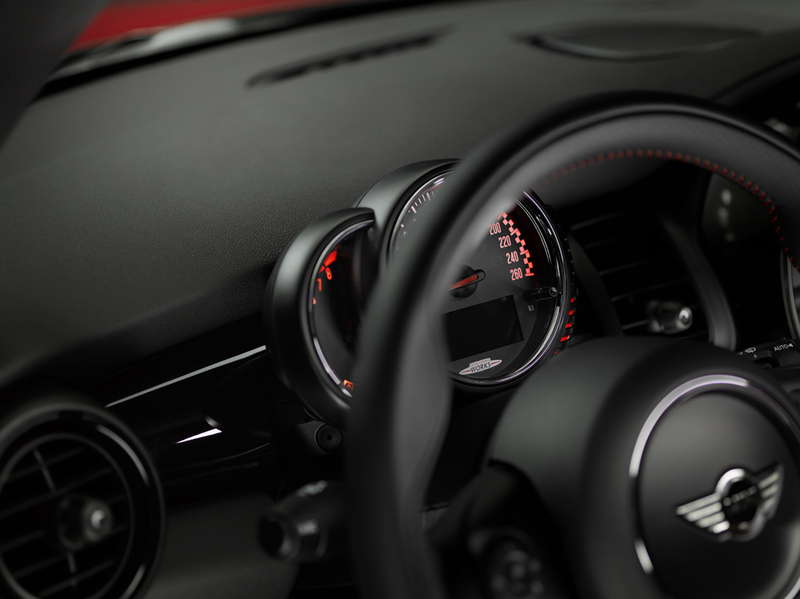 This entry was posted in production and sales and tagged press sales on December 10, 2014 by James Day. 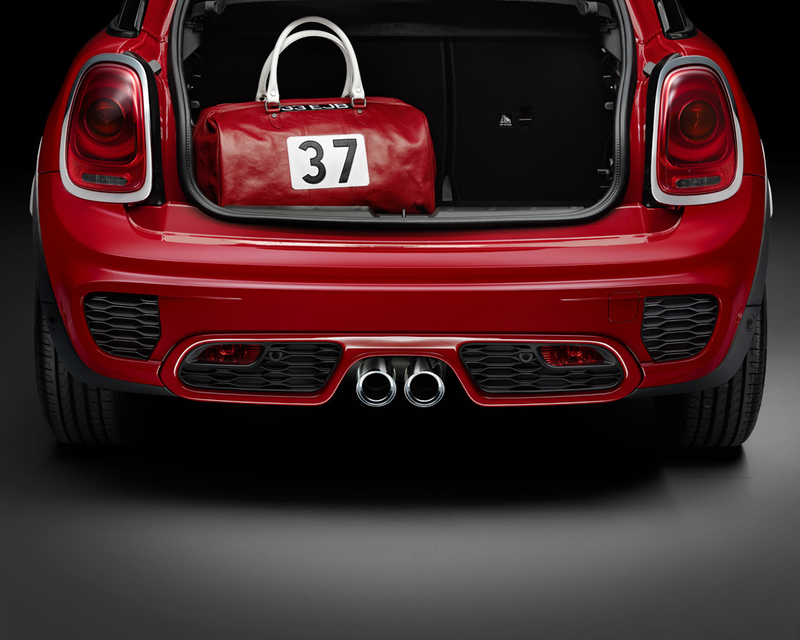 November saw the MINI brand reach a new high for the month. 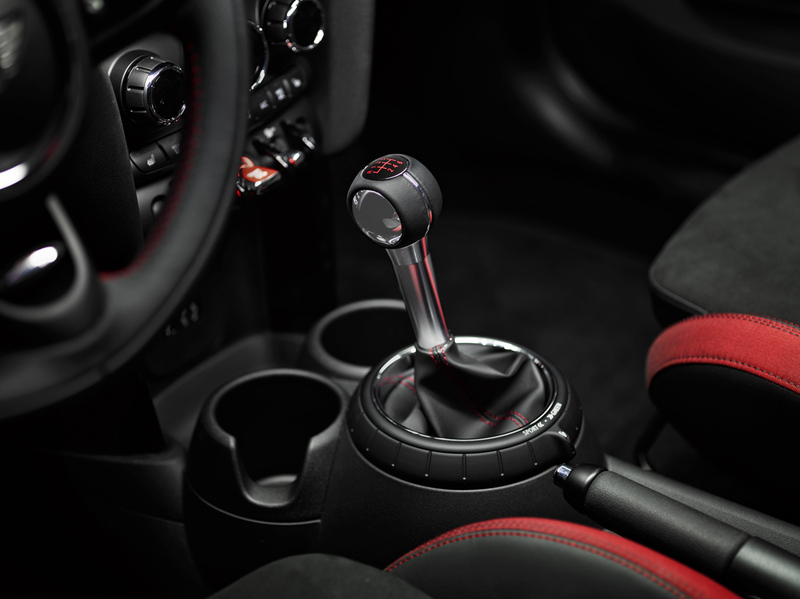 Global deliveries totalled 29,018, an increase of 16.7% compared to the same month last year (24,873). 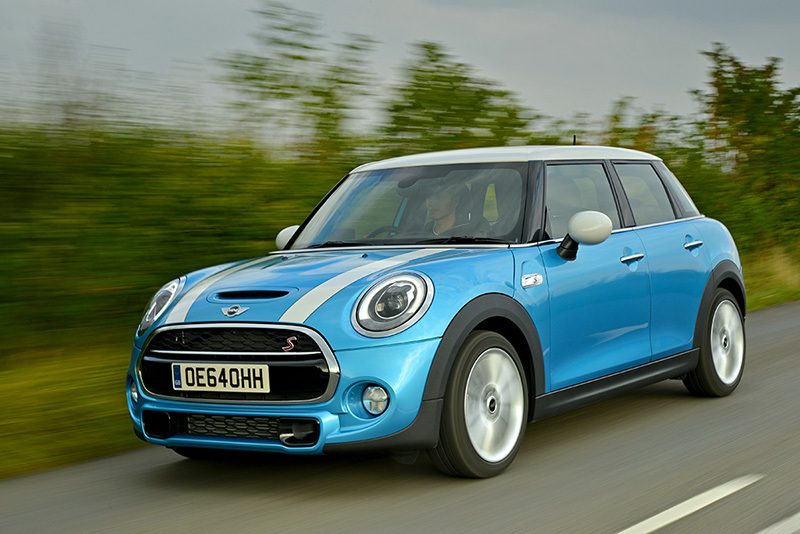 The all-new third-generation core MINI three-door model saw sales increase 26.3% compared to November last year (13,248 / prev. 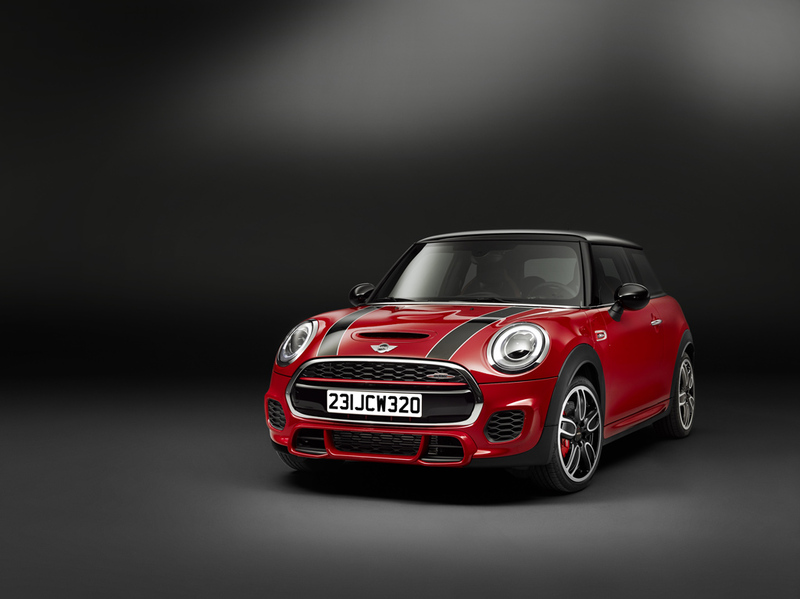 yr. 10,488) whilst the newly launched MINI five-door model achieved total sales of 4,033 in the month. 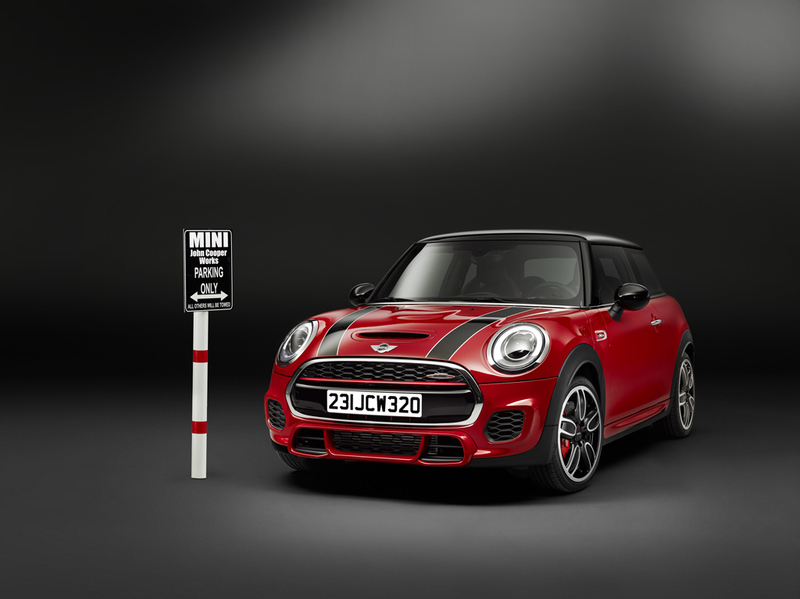 The model change earlier this year continues to affect the brand’s year-to-date figures; deliveries total 265,404, down 3.3% on the first 11 months of last year (274,575).